World Of Renewables have been confirmed as Gold Media Partners for this years event in Dubai. With events spanning four continents, Intersolar is the world’s leading exhibition series for the solar industry and its partners. It unites people and companies from around the world with the aim of increasing the share of solar power in our energy supply. By providing first-rate services, our exhibitions and international conferences bring businesses, technologies and people from the most important markets around the globe together. We have more than 20 years of experiences in opening up markets, providing specialist knowledge and creating links: Connecting Solar Business! Intersolar has been actively involved in the Middle East region since 2013 with various event, like the Intersolar Summit Middle East that took place in Riyadh, Saudi Arabia. 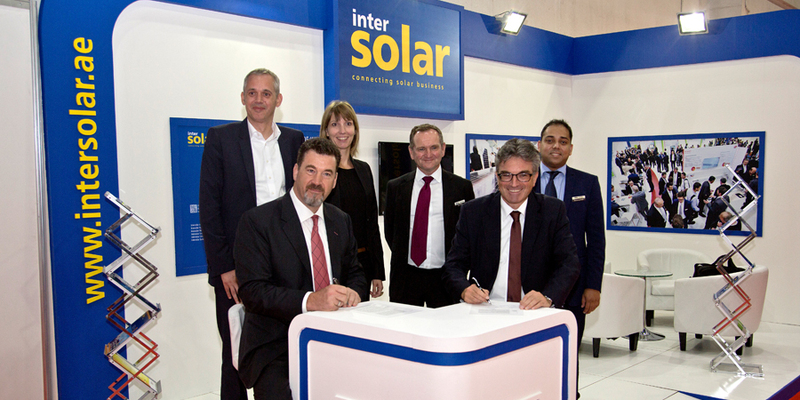 In 2016 Intersolar is teaming up with dmg Events to organize the key event in the Middle East taking place in Dubai dedicated to the solar industry: Intersolar Middle East. The event’s exhibition and conference both focus on the areas of photovoltaics, PV production technologies, energy storage and solar thermal technologies. Since being founded, Intersolar has become the most important industry platform for manufacturers, suppliers, distributors, service providers and partners of the global solar industry.